Weegee not only captured the gritty underbelly of New York City in his explosive photographs, but he lived it as well. This long out-of-print autobiography, brought back as a print book, ebook, and audiobook with complete and unabridged text by Devault-Graves Digital Editions, was written toward the end of Weegee's life before he was the photographic legend he is today. Here he tells the story of how an impoverished Jewish immigrant named Arthur "Weegee" Fellig from Zlothev, Austria, came to grips with one of the toughest cities in the world and made it his own. 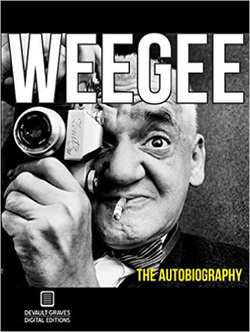 In wisecracking prose that is a match for his unblinking ferocity behind the camera, Weegee recounts his days of taking tintypes of kids on ponies and how this knowledge of the streets and neighborhoods of New York led to him being the first on the scene of the city's every murder, disaster and heartbreak. In Weegee: The Autobiography the author candidly and without reserve tells readers about documenting the grisly street executions by Murder, Inc., tenements up in flames, child killers, lovers in the back rows of movie theaters, and the sexual misadventures of streetwalkers, pimps and transsexuals, all in a voice that had seen it all and loved it all. Our version contains a wealth of new material for readers. Included are extensive annotations and endnotes, an original Afterword by author and critic Ed Ward, a bibliography of Weegee's photography books, and a guide for further study on works about Weegee. "More so than the majority of autobiographical reflections by photographers, Weegee: The Autobiography lets the reader experience the entire process of making art and capturing social scenes."